Thanks so much for subscribing to the VIVA ZIVA! Newsletter. I’ll be issuing a newsletter every three months, with a new free design each time... exclusively created for the newsletter. WHAT’S IN EACH VIVA ZIVA! NEWSLETTER? A NEW HANDBAG IS IN THE WORKS! I’ve just finished stitching a New Handbag creation called ‘Dutch Iris’. It was inspired by the free flowing designs of the Art Nouveau period. I combined contemporary colours of tan, taupe and black to the classic Art Nouveau colours of turquoise, mauve and peach tones. What a great combination! The youthful-rounded shape of the hobo bag works well with the delicate curves of the stylized Dutch Irises. In the photo at right, the detail has already been stitched and the black background is being added. 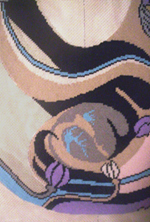 Note the black background is being filled in with the Basketweave Stitch: visible in the photo at 45°, and being stitched from top right to bottom left. go to the ZIVA Website. It’s also the ‘Your Stitch to Try’ in this newsletter. HELPFUL TIP: Because the bag has a rounded shape, I marked the canvas threads with a waterproof marker at regular intervals horizontally and vertically on the back before blocking it. This gave me the necessary guidelines to make sure it would be straight when I blocked it. Go to the website for more detail info on blocking. Now all I have to do is stitch the full width pocket for the back of the handbag. I’m really looking forward to making it up...it’s a stunner! 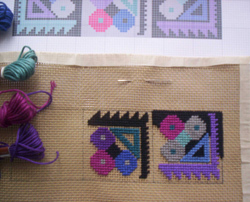 Then it’ll be ready to show it to you finished on the Handbags and Purses page of the ZIVA Needlepoint Designs site! Your first stitch to try has to be the Basketweave Stitch. 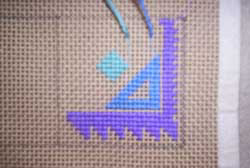 It’s very important to master this basic needlepoint stitch! That’s why I created the Anatolie bracelet design exclusively for my first newsletter. All the angles are on 45° to help you see how the basketweave stitch works. It’s the perfect design, with squares and triangles, to get you started. 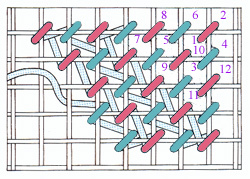 The diagram at right shows the basketweave stitch on a woven evenweave canvas. Starting at # 1, work the red stitches on the diagonal down on the vertical row of threads. The turquoise represents the stitches that you work up on the horizontal intersections. Always work from the top right diagonally to bottom left. If you buy a mono evenweave canvas for the bracelet, go to the ZIVA website to learn how to ‘read’ the weave of the canvas thread intersections as your stitching guide. With an interlock canvas, all the intersections are the same. So if you have to take a break from your stitching, always leave your needle in the row you’re stitching, so you’ll know which direction to continue when you get back to it. You don’t want two rows to be stitched in the same direction which can cause ridges in your final tapestry. This bracelet design was inspired by a 19th century design from a border of a prayer rug from Anatolie (now Turkey). It’s made up of graphic bouquets of carnations simplified to elemental geometry in cool colours of turquoise, purple, fuchsia, blue, grey and black. I’m including two coloured charts for your reference at different gauges, so you’ll have no trouble getting the canvas in your area. This second one above is for canvas at 13 holes per inch. All the yarn colours are from the DMC Soft Cotton Colour Range, which are readily available at your local needlepoint shop or online. You will need two skeins each for the background colours and one skein each for the rest of the colours. Note that some of the colours are repeated in all the squares. Go to the ZIVA site for more detail info on the materials required. protect the yarns from getting frayed. Count the canvas thread intersections and outline the basic shape and square divisions of the bracelet with a waterproof pen as shown. Start with the detail first as shown. Note: you have an option of black (as shown here) or light grey for the diagonal square in the central panel. Your choice. I chose a light weight black cotton fabric as a backing for finishing the bracelet. Make the backing longer than the actual tapestry at one end to create a tab to your desired measurement. Then sew on a thin strip of Velcro as shown onto the tab. 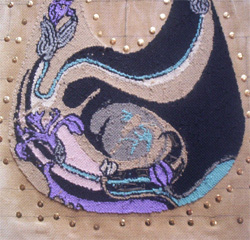 The other part of the Velcro is sewn on the opposite end of the backing before the backing is sewn to the tapestry. If you want to wear the bracelet looser on your wrist, or farther up your arm, you should consider this alternate method. Add two longer narrow tabs as shown to suit the size you want, and fasten the bracelet with Velcro. colours, you may prefer this scheme! you what it looks like. Contact me and I’ll give you the range of colours from DMC that will give a totally different look! Repeat the square pattern and make up a belt ! You can vary the colours from one square to the other…even add a border of one of the accent colours if you want the belt to be wider. You can fasten the belt with Velcro as described above or add some fabric to the ends to tie it lower on your hips. Use your imagination and make it your own creation! Send me a photo of what you’ve done. I’d love to see it and put it on the site! ASK THE ZIVA DIVA ! Are you a canvas painter or an artist? This question came from someone who has had a frustrating experience when stitching a hand painted canvas. The canvas she received was painted by an artist who did not understand how the stitches can affect the shapes and pattern of the design. The artist also didn’t take into account the limitations of thread colour selections available to achieve shading. So to answer the question, I’m a canvas painter and a designer. stitches will be so the design is not compromised. All the colours in my designs are selected from actual yarn colours. Lots of exciting things coming up! 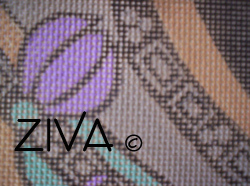 All the ZIVA Needlepoint Designs you see on the Web site will be available to order in May 2009! The next VIVA ZIVA! Newsletter #0902 will be issued in July 2009 . Free needlepoint design of a mini-belt-bag for your cell phone! And lots of other features! Please contact me if there is a particular stitch you’d like me to use for a free design in a future newsletter! Share this newsletter with friends and relatives. Looking forward to sending you the next newsletter! © Copyright ZIVA Needlepoint Designs 2008-2012.